Super Cobra cannot really be discussed without mentioning Scramble. Very early (1981) horizontal-scrolling shmup noted for distinct level designs. The player needs to bomb fuel tanks to keep the ship fueled and flying. It was officially ported to few systems, but platforms like C64 got very many clones with names like Scramble, Skramble and so on. Konami sometimes considers it the first game in the Gradius series. 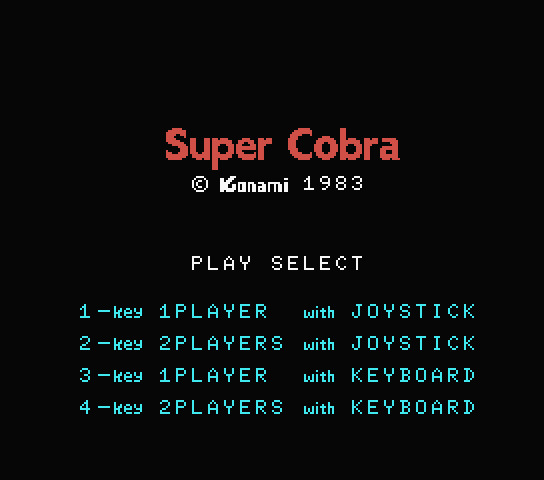 Super Cobra (arcade longplay on YouTube) is very much like Scramble in terms of gameplay. 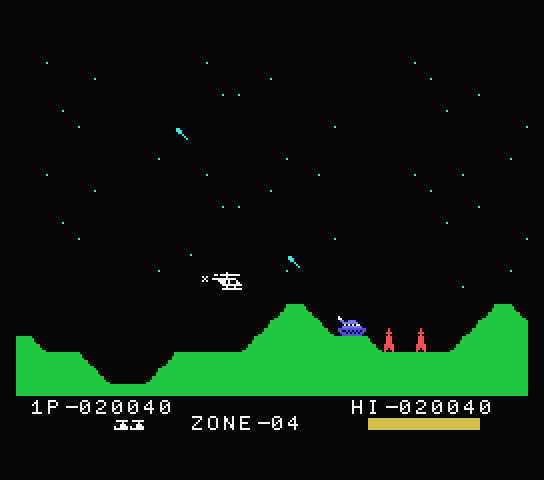 Instead of a rocket ship, the player instead controls a helicopter. But unlike Scramble, it got many official home platform ports, even on platforms I had never heard of before, like Entex Adventure Vision and Sord M5. Military equipment isn't my forte, but going by Wikipedia, Bell AH-1W "SuperCobra" was first introduced in 1986. That's why I don't think the game has been named after that chopper. Enough dawdling, on with the MSX port (Konami, 1983) now. Like in the original, there are no powerups. The chopper can shoot straight forward and drop bombs, but on MSX there's only one bomb in motion at a time. The game looks different from what the arcade original does, and I think it's for the better. First off, the arcade original is in TATE mode, which makes little sense with a horizontal-scrolling shmup. Second, the wildly varied colours are far more muted, even if the same green is used for the terrain in all levels. There are also fewer zones: only four before the game loops from start, while the arcade original has eleven. The ground/ceiling is also limited to only rather narrow bands at the bottom and the top, so the middle of the screen is always free of that type of danger. Last zone of the first round; the tanks have started shooting. That said, the levels here are still distinct in how the enemies behave. 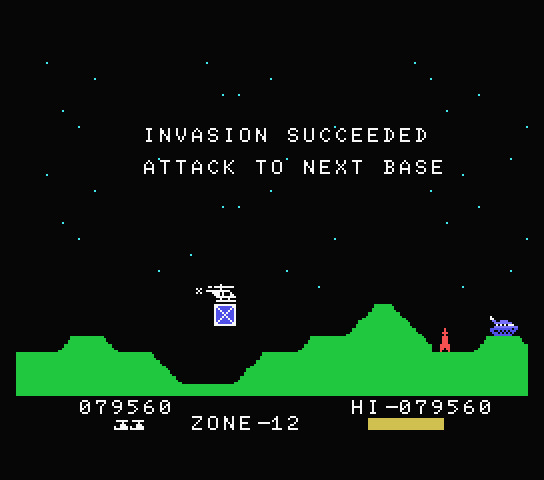 The first zone has missile-shaped "mutants" leaping in an arc (that's what the English MSX manual says, the arcade manual speaks of arcing missiles), the second zone has two types of UFOs dancing up and down, the third takes the chopper to a cave and the player has to dodge falling missiles, and the final fourth zone will have missiles launching straight up. And at this point, the tanks also start shooting at 45-degree angle to the skies. 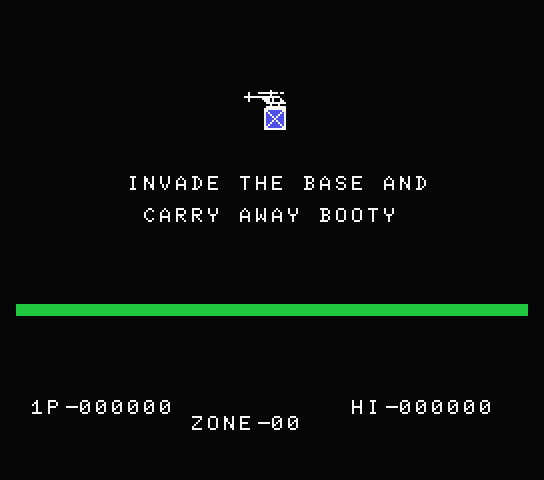 The zone ends by the player capturing the booty (yes, that's the name the game's intro sequence uses) and speeding over the remaining enemy territory. Third round finished, still looks the same as the first round. Then the game starts from the first zone, but the tanks will keep shooting. The third round ramps up the UFOs' number and speed significantly. One zone takes roughly one minute, probably depending on whether it's run on a 50 or 60Hz system (during which the helicopter has flown 100 miles according to the game). Having played the game a few times now in 2018, I haven't got past zone 18, so that would be at most half an hour in one game. For gameplay video on the first four zones, see the MSX Channel. The game fits in an 8KB ROM image, which may help explain why there's not even a palette swap for the terrain between loops. That might explain why there isn't much in the way of animation in the game either. The chopper has two frames of animation total, the bombs have just one and all explosions are just one sprite as well. All the enemies also have just one frame of animation each. There is no music outside of brief melodies at the start of the game and at the end of zones, and a warning siren when the fuel is about to run out. The sound effects are also limited to krak (front-facing gun) and crash (explosion)... and an undulating sound when the UFOs are on screen. Unlike in the arcade original, the fuel isn't so much stocked in small increments but missing any of them practically means the chopper will fall. While I haven't played the arcade game, I can imagine this changing the gameplay noticeably. If you've read my earlier blogs on MSX games, you might remember the scrolling in eight-pixel steps due to the video chip limitations. 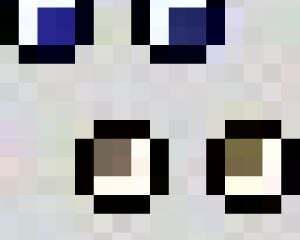 Here, however, the screen scrolls in four-pixel increments. I imagine this has been achieved by creating a second background tile set, only offset by 4 pixels. Seeing a tank right behind a hill "eat away" a small triangle of the hill every other time the screen scrolls forward fits the theory. As for how I would rate the game -- it's not that much fun. It controls well, but it lacks variety. Then again, I find Defender repetitive as well.